The development studio known as Dynamic Pixels and the publishers over at tinyBuild are getting ready to release a different kind of action indie sandbox adventure game. 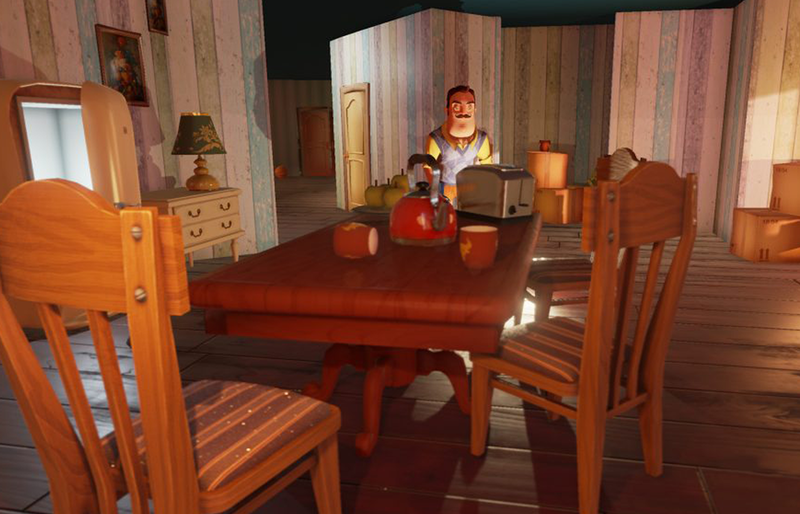 In Hello Neighbor, you’ll be taking on the role of a nosy nellie who’s trying to figure out what secrets your neighbor has hiding in his basement. Don’t be taken off guard by the cartoon graphics. As you’ll see in the trailer, you need to be a master at stealth, to stay safely away from the horrors and scary consequences otherwise. The antics place in Unreal Engine 4. Your neighbor is an advance AI bot and a force to be reckoned with. Learning from your actions, the neighbor will set up countermeasures to outfox you. If you tend to try your luck sliding through the front door, he’ll set up cameras to keep watch over the area. Crack open a window, and you might be jumping straight into a bear trap if you’re not careful. Hello Neighbor comes out in the Summer of 2017 for PC. To learn more about the game, check out their website, Twitter, and Facebook. If you want to sign up for the Alpha, you can do so over here.